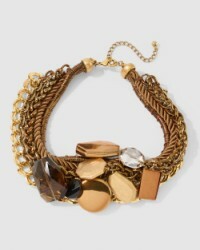 Only a few more hours to enter the Chico’s statement necklace giveaway. I think it would look good with J Crew’s cotton modal dress seen in this post. We got an email from Michelle. Let’s help her pick a jacket. Here’s the preamble. Lighter jacket: From Gap, currently not online. Click here for similar knit option by Gap. Very cute. 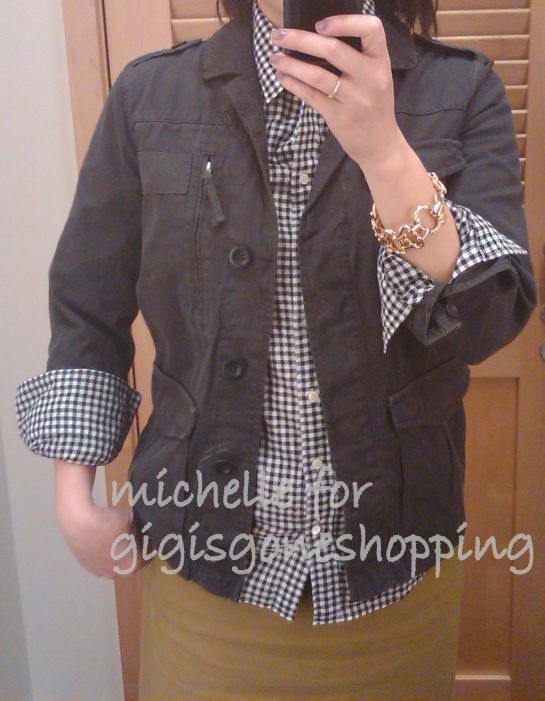 Darker jacket: J Crew lieutenant, reviewed in this post. Shirt: Here and here by J Crew. Similar at Kohl’s and Nordstrom. Skirt: Different color, but similar here. Bracelet: Similar here, here, here and here. ETA: The poll is now closed. i like the darker one. where is it from? I like the first color! I like the second coat. Seems more versatile to me. Thanks for the votes so far! DinDin – I just updated the post w/the jacket info. The lighter one is Gap. The darker on is J Crew's lieutenant. I think the first one, especially if you are going to be wearing it at your kids baseball games. The darker color would show the ball field dirt more. Somehow that dirt ends up everywhere! Thanks everyone for voting and commenting! I appreciate the post, Gigi – you rock. I'm trying to not let price sway me and go with the one that I really like best, but for what it's worth, the lighter one from Gap is on sale in store for $49.99. The J Crew lieutenant is full price. 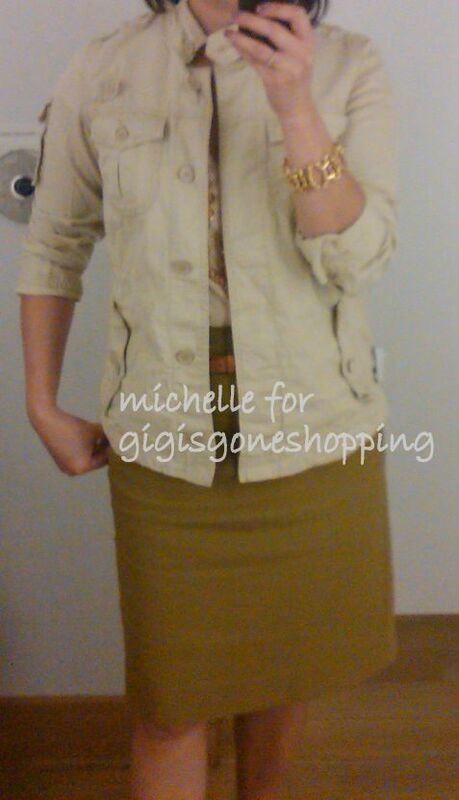 Strong, for a girl – I reviewed the ON twill jacket in this post. I ended up getting/keeping the S in dried grasses. Michelle – Try the ON one as well. There are darker options. You can get something in between the lighter Gap jacket and the dark lieutenant jacket. We already discussed pros & cons via email. I am still a fan of the cut/fit of the Gap jacket. So if you don't want to keep that color, keep lookin. Definitely try the ON option (see link above). You can ask for their foldout flier which has a 30% off a single item coupon in it. It has Sweet Deals! on the front and the caption at the top is that it's 'A guide to this week's deals, steals & favorite looks.' The 30% coupon is good thru 4/4. Thanks Gigi! I did try the ON one in store during F&F weekend – bought a bunch of other stuff but left that jacket behind. Just didn't like the way the mid-section of the jacket hung on me. I was wondering if anyone has tried the Lands End Canvas option here: http://tinyurl.com/ydhf84d I'm not sure I like the drawstring at the bottom, I wonder if it would look ok pulled out. Michelle – I haven't tried any Canvas pieces. I don't know if you noticed, but the web description says the jacket hits high hip. That's another term for cropped, in my book. Something to consider, but it wouldn't hurt to try it. It's very cute. I like the lighter one, especially if you're going to pair it with jeans and such. I may have to check it out at GAP, which btw is having 40% off one FP item every Wednesday (three more left). Get the Gap one with the 40% off coupon! I have that same one, its a little tight in the arms but not too bad. I like the darker one. And, I have an extra Gap 40% off coupon thingy for the Wednesdays promotion if anyone wants it! I also have 3 extra Banana Republic 40% off coupons for Wednesdays in the month of April. Let me know if you want the coupons! Rynetta, I'd love a coupon or two. 🙂 Thank you for your generous offer. Email me at jenn@ldedge.com. No problem, Jenny! I just sent you an email! I just want to tell you that I am beginner to blogging and really liked this website. More than likely I’m want to bookmark your blog post . You actually have remarkable articles and reviews. Many thanks for sharing with us your blog. I just want to tell you that I am just all new to blogging and site-building and honestly loved your web-site. Probably I’m planning to bookmark your site . You amazingly come with outstanding article content. Thanks a bunch for revealing your web site. I just want to say I’m all new to weblog and really liked this web site. Almost certainly I’m likely to bookmark your site . You certainly have awesome article content. Regards for revealing your web-site. I just want to say I’m new to blogging and site-building and certainly loved this page. Probably I’m want to bookmark your blog post . You definitely have really good stories. Kudos for revealing your website page. I just want to mention I am newbie to blogging and site-building and definitely liked your web blog. Probably I’m likely to bookmark your blog post . You amazingly come with incredible writings. Thanks a lot for sharing with us your blog. Hey very cool blog!! Man .. Beautiful .. Amazing .. I will bookmark your blog and take the feeds also…I’m happy to find so many useful info here in the post, we need develop more strategies in this regard, thanks for sharing. . . . . . I simply want to tell you that I am just newbie to blogs and honestly savored you’re web-site. Very likely I’m want to bookmark your website . You definitely have really good articles and reviews. Thanks for revealing your website page. I simply want to say I am very new to blogs and certainly loved your web site. Likely I’m planning to bookmark your website . You certainly have awesome well written articles. Regards for sharing your web site. fantastic issues altogether, you simply gained a new reader. What would you suggest in regards to your submit that you made a few days in the past? Any positive? I will right away take hold of your rss as I can not to find your email subscription link or e-newsletter service. Do you have any? Kindly let me recognise in order that I could subscribe. Thanks. I¡¦m now not certain the place you’re getting your info, however great topic. I needs to spend a while studying much more or working out more. Thanks for great information I used to be on the lookout for this information for my mission. I just want to tell you that I am just beginner to weblog and certainly loved you’re website. Very likely I’m going to bookmark your website . You definitely come with awesome writings. Kudos for revealing your web-site. I just want to mention I am beginner to blogging and site-building and absolutely savored you’re blog site. Almost certainly I’m want to bookmark your blog post . You absolutely have superb well written articles. Appreciate it for sharing with us your web page. Hello.This article was extremely fascinating, particularly since I was investigating for thoughts on this topic last couple of days. I wish to express my thanks to this writer just for rescuing me from this circumstance. After exploring through the online world and finding ideas which are not productive, I assumed my entire life was over. Being alive minus the approaches to the issues you’ve resolved by way of the site is a crucial case, and the kind which might have adversely affected my career if I hadn’t come across the website. Your own competence and kindness in handling the whole lot was very helpful. I am not sure what I would’ve done if I hadn’t come across such a subject like this. It’s possible to now look forward to my future. Thanks very much for the expert and results-oriented help. I won’t be reluctant to suggest your web sites to any person who needs guide about this subject matter. I just want to mention I am just beginner to blogging and site-building and truly enjoyed you’re page. Likely I’m going to bookmark your site . You actually come with fabulous article content. With thanks for sharing your web site. I just want to mention I’m very new to blogs and seriously savored you’re web blog. Probably I’m planning to bookmark your website . You certainly come with great articles and reviews. Thanks a lot for sharing your blog site. Whatever man has done man may do. I¡¦ve been exploring for a little bit for any high-quality articles or weblog posts in this sort of house . Exploring in Yahoo I eventually stumbled upon this website. Reading this info So i am happy to show that I have an incredibly excellent uncanny feeling I discovered exactly what I needed. I most certainly will make certain to do not forget this web site and give it a glance on a continuing basis. I would like to thank you for the efforts you’ve put in writing this website. I’m hoping the same high-grade site post from you in the upcoming also. Actually your creative writing abilities has encouraged me to get my own blog now. Actually the blogging is spreading its wings fast. Your write up is a great example of it. What i do not realize is in reality how you’re no longer really much more smartly-appreciated than you may be now. You’re so intelligent. You recognize thus significantly in terms of this matter, made me for my part believe it from numerous varied angles. Its like women and men aren’t fascinated unless it¡¦s something to accomplish with Girl gaga! Your individual stuffs nice. At all times deal with it up! Well I truly liked reading it. This post procured by you is very useful for accurate planning. I would like to thnkx for the efforts you’ve put in writing this site. I am hoping the same high-grade site post from you in the upcoming also. In fact your creative writing skills has inspired me to get my own website now. Really the blogging is spreading its wings fast. Your write up is a great example of it. Right here is the perfect website for anyone who wants to understand this topic. You understand a whole lot its almost hard to argue with you (not that I really will need to…HaHa). You definitely put a brand new spin on a subject that’s been discussed for ages. Great stuff, just great! Great goods from you, man. I have understand your stuff previous to and you’re just extremely magnificent. I really like what you have acquired here, certainly like what you are stating and the way in which you say it. You make it entertaining and you still care for to keep it sensible. I can not wait to read much more from you. This is really a tremendous site. Thank you for some other informative site. Where else may just I am getting that kind of info written in such an ideal manner? I’ve a mission that I’m just now running on, and I’ve been on the look out for such info. Can I just say what a comfort to uncover someone who truly knows what they are discussing online. You actually realize how to bring an issue to light and make it important. More and more people should check this out and understand this side of the story. I was surprised that you’re not more popular given that you surely possess the gift. An intriguing discussion is worth comment. I think that you should publish more about this topic, it might not be a taboo subject but typically people don’t discuss these topics. To the next! Best wishes!! certainly like your web-site but you need to take a look at the spelling on several of your posts. A number of them are rife with spelling problems and I to find it very bothersome to inform the truth nevertheless I’ll definitely come again again. naturally like your web-site however you have to take a look at the spelling on quite a few of your posts. A number of them are rife with spelling issues and I in finding it very bothersome to inform the reality however I¡¦ll surely come back again. Excellent goods from you, man. I have understand your stuff previous to and you are just extremely excellent. I actually like what you’ve acquired here, certainly like what you are saying and the way in which you say it. You make it entertaining and you still care for to keep it wise. I cant wait to read much more from you. This is actually a great site.